December | 2008 | BriefcaseDiva...Always Working for You! This was my most read blog post of 2008. It totally cracks me up because I was simply being my silly self when I wrote it. Hope you enjoy! Please be sure to leave a comment. The other day I was talking to my stepmom who is as southern as they come. She loves working outside in her garden, loves horses, and is just an all around wonderful lady. Well, during our conversation, she told me that a family would be dropping off some chickens so I assumed that she was going to start raising chickens. That was not the case! The family was dropping the chickens off so that she could ring their necks and pluck them! All I can say is…G-R-O-S-S!! Just the thought of it makes me want to throw-up!! While I love meat and will not turn down a good steak, I cannot look at raw meat. Just being in the meat section, at a local grocery store, grosses me out! This past Monday (Memorial Day), I thought that I would be a good wife and make dinner for my darling hubby. After all, he does ALL of the cooking as I was not made to be in the kitchen. Let’s just say the fire department is on speed dial when I try to cook. It’s not pretty! Anyway, back to my story, I decided that I was going to make a pork roast in the crockpot…not hard, right? Well, it was because I had to handle the raw meat! So, I put on a pair of rubber gloves and goggles and proceeded to wash the meat, put a pork rub on it and placed it in the crockpot. This was all done, of course, in a lovely pair of pink stilettos! My husband thought I was crazy, but got a good laugh while watching me attempt to make him dinner. He especially got a thrill out of the rubber gloves and goggles. Hey, a diva has got to protect herself, right? I gladly turned the kitchen back over to him on Tuesday!! So girlfriend, try something new today. Just remember to wear your high-heels and definitely wear gloves…you don’t want to get your hands dirty and ruin those lovely nails!! Until next time…wear your heels well!! In today’s Diva Rants, let’s discuss followings on Twitter. Like thousands of other folks, I enjoy Twitter. I love to interact with people that I most likely would not meet face-to-face. I enjoy hearing about their lives, their children, their pets, and their businesses. I enjoy learning from my friends on Twitter. Likewise, I enjoy sharing my life and my businesses with my Twitter followers. I have quality things to share with others and have made many wonderful connections. Boy, what an eye-opener! It was rather interesting to find that people whom I’ve grown to respect are not reciprocating the following. I find this to be utterly RUDE! Why should I spend MY time reading that you’re drinking coffee or playing with your dog when I’m doing the same thing and you haven’t given me the courtesy to share my doings? Well, my time is just as valuable as the next gals, so I’ve decided to “release” those who are not following me in return. That way, when spending 2-3 hours reading other peoples Tweets, some valuable and others just gibberish, at least I will know that my Tweets are getting equal exposure. And that’s today’s Diva Rants! P.S. Would love to hear your rants about this topic! Be sure to leave a comment. Oh yeah, one more thing…follow me on Twitter! My status today: Huge agenda today! Working on a product to launch by Feb 1st. Some exciting stuff getting ready to roll out. Yay!! 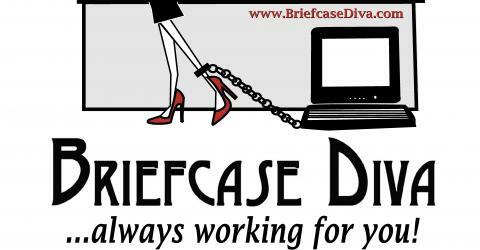 Can’t wait to share with you all of the exciting things that are happening around the office at BriefcaseDiva. We are currently updating our much needed website, creating information products that are going to knock your socks off, and much more. Oh, I don’t want to forget our exciting guests that will be appearing on Diva Talk Radio. 2009 is going to totally rock!! Hope you’ll share the new year with us! What does HOPE mean to you? Please share. I’m cleaning today…not my favorite thing to do, but I’m wearing a lovely pair of high-heeled slippers, of course! Enjoy your day friends! Have you lost your Diva-ness? As women, we are surrounded with so many obligations that we tend to lose sight of who we really are. When we get married, we are known as so-and-so’s wife. When we have children, we are known as “mom”. We are the daughter, the sister, the girlfriend, the housekeeper, the cook, the taxi driver, the referee, the homework helper, the bath-time police, the dog groomer, the Sunday School teacher, the family counselor, the employee, employer…the list just goes on and on. After awhile we forget that we are a real person. Well Diva, sit up straight, shoulders back, and put your favorite stilettos on, because YOU ARE PRICELESS! You are deserving! You are beautiful! You are a hand-crafted masterpiece! Join me over at Diva Talk Radio today at 2:00 p.m. EST where we are going to empower, motivate and encourage you. It’s going to be a Diva-licious show, so you don’t want to miss it! Until next time…wear your heels well! Diva Talk Radio: http://blogtalkradio.com/divatalkradio. Be sure to register so you can join in our chatroom. What is your idea of success? A healthy view of success and failure plays an important role in the achievement of our goals. One man’s failure is another man’s stepping stone. Let’s explore just how crucial those views really are to reaching your goals, shall we? Success, according to society, is the positive outcome of a desire. For example, think about those who want to start their own business. In order to be successful, establishing a business would need to happen. The ultimate success, which is what most people are looking for when they set goals, would be creating a profitable business. Along the way to a fulfilled goal, there are many steps in between. Some will be solid and some rocky. How we handle these steps will determine whether we reach our ultimate success or not. Failure can be thought of as not meeting our goal. To help better understand think of what it’s like when a runner, competing in the 100-meter dash has a goal of finishing first. When he or she doesn’t quite reach the goal and comes in second, third or any place but the one that earns them the blue ribbon that can be thought of as failure. Have you ever heard of losing the battle but winning the war? We are conditioned to see any type of setback as a failure and only winning as a success. With goals this presents a unique challenge. There is a need to learn to stretch our minds beyond conditioning into new realms. First of all, each of the steps we mentioned above can have an outcome that is different from the final outcome. Goal setters need to know that each step leading to a goal is fluid – they are subject to change at any time. In this way, we are able to amend our final goal or choose a new path to follow to reach our initial goal. Let’s try an example. There is a person who wants to learn a new language. Their goal is to learn to speak Italian within a year. First, they start off by taking a course at the local college. They don’t get along with the teacher’s style of instruction so at the end of the semester, they haven’t learned much. With that step, our person can abandon their goal as a failure or view this as a setback. In the second instance, it is necessary to choose a new path for the ultimate goal. This time, our person chooses a DVD language learning series. The instruction allows them to set a pace they can live with and use fun visuals to supplement the voice of a native speaker. Six months later, they understand and are speaking passable Italian. The first step in this goal could be categorized as a failure but, because they didn’t give up and simply readjusted their steps, the goal itself was still accomplished and considered a success. Suspending our perception of failure and success is necessary when setting goals. Each task on our goal’s to-do list can be a success or failure but that doesn’t mean our entire goal will be unsuccessful. I’ve just completed a 4-Part series on Creating and Effective Business Plan and invite you to listen to the playback audio (Diva Talk Radio). This series concentrated on goals and business planning. Be sure to pick up the Action Guides that accompany the series and leave me a comment.